In addition to working in an ever changing business climate, family-owned companies face a host of unique challenges that often complicate the day to day running of the business. 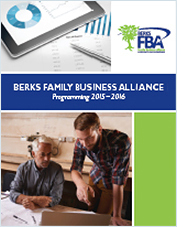 Berks Family Business Alliance (FBA) was created to address these pressing issues, helping businesses find solutions to the complex issues that families working together often struggle to overcome. The Chamber strives to provide programming that is beneficial to our members. We hope you will take advantage of all the opportunities FBA offers! Berks FBA Spring Symposium - Save the Date! We are pleased to announce the date for our Berks FBA Spring Symposium with Adam Sheetz, Assistant Vice President of Operations of Sheetz, Inc.
Adam Sheetz supervises five operating regions that oversee all the companies' stores. His previous positions at Sheetz included Regional Operations Director for North Carolina Stores; Director of Petroleum Supply; and District Manager. Prior to joining Sheetz, he worked for four years as an investment banker for Lehman Brothers, Inc. and Barclays Capital, Inc. in New York. He holds a B.S. from Penn State University and an M.B.A. from Emory University in Atlanta. Sheetz is a family-owned convenience store chain based in Altoona, Pa.
For more than 60 years, the chain's mission has been to meet the needs of customers on the go. It's one of the fastest growing family-owned convenience stores in the world. The chain boasts more than $6.9 billion in revenue, with more than 500 store locations throughout Pennsylvania, West Virginia, Virginia, Maryland, Ohio and North Carolina. The convenience retailer also employs more than 17,000 people. Sheetz takes seriously its mission to provide fast, friendly service and quality products in clean and convenient locations. Sheetz' vision is to create the business that will put Sheetz-as it stands today-out of business. For additional information or to register, contact Kim Musko, 610.898.7778. Is my business marketable? What are my transition options? What steps do I need to take now to meet my future ownership goals? These are all questions that many family business owners ponder on a daily basis. In a business environment where seven out of ten companies are expected to change hands in the next seven years, business owners need a proactive transition strategy. From understanding what drives your company's value to assessing the market's appetite for companies like yours, this session will provide the answers and insights into how to prepare as you approach the finish line. REGISTRATION: Click here to register, or contact Kim Musko, 610.898.7778. Having a climate of order in a Family Enterprise includes addressing matters BEFORE ISSUES OCCUR to prevent severe family member conflicts. This discussion will address topics that are generally best practices in a family enterprise such as documenting, organizing and understanding the details of various agreements. 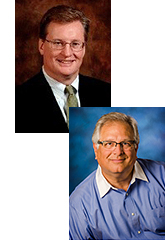 George Balchunas and David Wimer will provide live experiences from situations they have encountered to deliver an engaging and informative session An attorney with Kozloff Stoudt, George has significant business organization experience, having assisted clients in the creation, management, merger and acquisition of all forms of business entities. David is a Family Business Advisor and Principal of David Wimer Advisors, LLC.. David works with family enterprises to help navigate through change: succession, acquisition, sale or crisis. Join our Next All in the Family Gathering at Brentwood Industries! These 'gatherings' are hosted by a local family business at their location. This is connecting with a purpose! A great opportunity to meet other area family-owned businesses, cultivate resources you can use, and build relationships in the community. These events are exclusive to family business owners and their employees. This FREE event will be hosted by Brentwood Industries at their Specialty Products Group building. Brentwood is a leading provider of thermoformed plastic solutions to a wide variety of consumer, manufacturing, and environmental industries. With diverse production capabilities, engineering expertise, and a focus on innovation, Brentwood applies a team approach to solve the challenges facing customers. Established in 1965 as a small thermoforming facility, Brentwood has transformed into a vertically integrated corporation and experienced rapid growth both domestically and internationally. This continuous progress has allowed Brentwood to engage developing markets and further establish its global footprint. The company emphasizes customer service and works closely with clients throughout the design, engineering, and manufacturing phases of each project to create targeted, tailored solutions. Join us and see what Brentwood is all about - have a light lunch, tour their facility and connect with other local family businesses! REGISTRATION: To sign-up for this event, contact Kim Musko, 610.898.7778. MEET ONE OF OUR SUBJECT MATTER EXPERTS! We have a full range of experts in all disciplines to assist you with those issues that are critical to your business' success. These professionals can offer up to two hours of one-on-one consultation at your office or their location. Kim Musko, Program Coordinator at 610.898.7778. A Certified Financial and Trust Advisor, Lori has been an investment and trust professional since 1981. With years of experience in key aspects of the trust and investment management services industry, from administration to operations and sales, she helps clients by identifying and creating solutions to their financial needs. Her experience with family-owned businesses stems from working with clients who are selling their business and are looking for realistic approaches to replace the income. She takes into consideration their risk tolerance, other assets and sources of income to develop a plan that can be easily implemented. Lori helps create a clear vision of what is most important- the clients' financial success. Meet father and son duo, Dave & Chris Roche, of Roche Electric - there is certainly a dynamic spark between them! Click to view the interview. ADDITIONAL READING FOR FAMILY BUSINESS OWNERS! The 5 Keys to Execute Any Strategy.